Air rowers have long been the industry standard for reliability and consistency. They typically utilize a fan and a system or adjustable air baffles to create varying levels of resistance. Their simple and dependable design offsets their reputation as being noisy relative to other resistance systems. With a company list price of $299.99 and a recent Amazon price of $299.00, the Stamina ATS Air Rower stands up quite well in the field of under $500 air rowers, and well ahead of the field of hydraulic resistance rowers in its price class. It is foldable for easy storage and features a sturdy steel frame backed up with a three year warranty. The parts warranty is for three months. The Stamina ATS Air Rower has a simple but adequate LCD data collection and display monitor that records speed, distance, time and estimated calories used. The monitor system does not support pulse data collectors or include any preset programs, but it does include a scan mode that switches between variables every six seconds. Unpacking and getting the machine up and running is a pretty simple affair. It is also a very simple operation to fold it away for storage. Once folded, you can stand it on it’s end making it take up remarkably little space. It’s not a loud as the Concept 2 due to it’s nylon strap, which is important if you live in an apartment (or you like watching TV whilst training!) The foot straps are adequate for big and small people alike. Unlike the C2, and most other machines, there is no way to adjust the resistance, which may be a problem for you. However, most people have the resistance set too high on their machines anyway, and the whole idea of an air baffle is that the resistance increases with your rowing intensity. I would not recommend this rower for somebody, who is planning on competing. 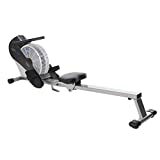 However, this is not most of us and at its current Amazon price the Stamina Air Rower 1399 is a good budget choice for home use. Originally listed at $549.99 by the company, and currently offered at $365.46 on Amazon, the Stamina ATS Air Rower 1405 is designed for the same user group as the less expensive Stamina Air Rower 1399. The extra hundred and fifty dollars of company list price gets the buyer a somewhat more comfortable machine with a chain drive. The chain drive would represent a significant improvement except that the drive, at least in early production models, has been plagued by reliability issues, often jamming or coming loose in the middle of exercise sessions. The chain drive also adds an additional source of noise to the already noisy air resistance system. The Stamina ATS Air Rower 1405 utilizes the same data monitor and display device as the lower cost Stamina Air Rower 1399. The three year warrantee on the frame and three month warrantee on parts is also the same for both models. The Stamina ATS Air Rower 1405 is about 17 pounds heavier than the Stamina Air Rower 1399, but it folds to store in about the same space. The Stamina ATS Air Rower 1405 is arguably better looking and more comfortable than the Stamina Air Rower 1399, but it is hard to justify the additional cost based on product performance. If the Stamina engineering group can resolve (or has resolved) the chain reliability issues, that step alone could dramatically improve the Stamina ATS Air Rower 1405’s competitive posture.